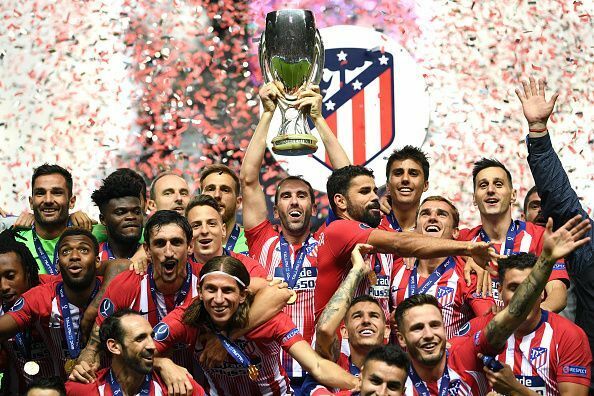 Atletico Madrid finally got their own back on Real Madrid in European competition by lifting the UEFA Super Cup on Wednesday, snatching a 4-2 win over their city rivals thanks to goals from midfielders Saul Niguez and Koke in extra time. Diego Costa gave Europa League holders Atletico a dream start against Champions League winners Real by firing them ahead after 49 seconds, knocking down a long pass and smashing the ball into the net from a tight angle. Real, playing their first competitive game since all-time top scorer Cristiano Ronaldo left and Julen Lopetegui succeeded Zinedine Zidane as coach, pulled level when Karim Benzema nodded in a cross from Gareth Bale in the 27th minute. Real, who beat Atletico in the 2014 and 2016 Champions League finals and dumped them out of the competition in 2015 and 2017, looked set to pour more pain on their neighbours when Juanfran handled and Sergio Ramos tucked the penalty away. Diego Simeone’s side, however, are renowned for their fighting spirit and despite being outplayed for sections of the second half they got back into the game with 12 minutes left through a thumping close-range finish from Costa. Brazilian left back Marcelo had the chance to grab Real victory in stoppage-time but he slipped as he tried to meet a Bale cross and extra-time was needed to settle an enthralling contest between the fierce rivals. Atletico were on the back foot for the start of the extra period but they were still able to press their opponents high up the pitch. That led to Raphael Varane giving the ball away outside his area and Saul thumped home a stunning volley from Thomas Partey’s cross in the 98th minute to restore their lead. Fellow academy graduate Koke struck six minutes later, finishing off a smooth team move to secure Atletico’s third Super Cup title.